*Life in Miniature*: New Classic Children's Books for You! 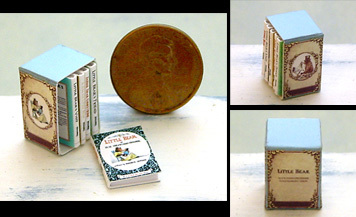 New miniature books for your dollhouse! 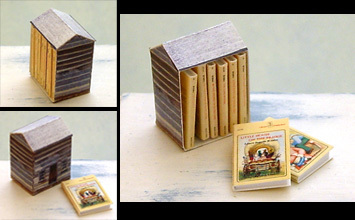 Two sets of classic children's books in adorable slipcases, perfect for any child's room. First up is the popular "Little Bear" series by Else Holmelund Minarik, illustrated by Maurice Sendak. The 5-volume set comes in a charming slipcase covered with a forest scene and illustrations from the books. The second set is an update to my "Little House on the Prairie" set by Laura Ingalls Wilder, with cover illustrations by Garth Williams. The eight books now come enclosed in a little cabin-shaped slipcase! You can purchase the sets on my website (links above), and I'll be listing them on Etsy tomorrow. I hope you like them! ¡¡ que bonita coleccion de libros !! Me parece una autentica maravilla . Los libros son preciosos y la cajita muy original. Me encanta la forma de casita que tiene, enhorabuena. Ha! Little House on the Prairie is my all time favorite stories! I read them all to my kids and pretty much, read everything she wrote. I LOVE the Little House on the Prairie set in the cabin-shaped slipcase! I had the books as a child. However the slipcase was just a plain, yellow and black corrugated box with Garth Williams' illustrations. Your set is fabulous! Thanks, everyone. I just thought it would be a fun way to box the set, and look so cute in a dollhouse bedroom!